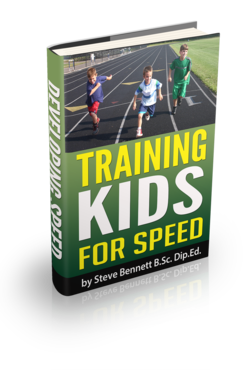 Training Kids for Speed is an E-book by Steve Bennett. It aims to integrate Modern Sprint Training ideas into the methods used with developing athletes for the improvement of speed. The aim of this book is to help all coaches, parents and teachers of Young sprinters. It also will be helpful in any sports which value fast running. "It is possible and desirable to learn how to run with the latest sprinting technique displayed by athletes like Marion Jones & Maurice Greene. The technique can be taught to kids once all of its elements are clearly understood. However acquiring this technique as a mature athlete requires long term training that is comprehensive. The aim needs to be on developing the required physical abilities and then using them so that the gains can be transferred into an improved running action. Training Kids for Speed outlines the process that is required." A passion for me as a coach has also been in developing Middle Distance runners. It cannot be emphasized enough how important it is to work patiently and persistently toward improving running form and speed. Good Middle Distance performance is very reliant on the athletes ability to run with and maintain good form so that they can run at the speeds that are required for the duration of their event. Thus, the principles explained in this book are important to a runner of any distance. All young athletes need to learn and practise running properly so that they can run faster easier and avoid injury. Following the principles displayed in Training Kids for Speed will almost certainly see clear improvement in the running performances of the athletes or players in your care. Many ideas contained in Training Kids for Speed should also help decrease the athletes chances of injury. There is a great range of ideas for you to choose from in Chapter 7 - Training Session Ideas. Reading Training Kids for Speed will prepare you to understand the importance of your children being shaped technically as they mature. It also explains the way that a large variety of areas of training impact on running performance and technique. It discusses what is good practice and what is not. If your children have programs that embrace the principles contained in this book they will have an increased chance of reaching their speed potential and will also have plenty of fun doing it. A detailed description of the latest technique of Sprinting that is displayed by Athletes like Marion Jones and Maurice Greene. Also discussion of how a knowledge of this can be applied to any developing athlete. The Nervous system is quite limited in its capacity to recover from certain types of stresses. This is a very important area to understand when aiming to produce and train for high speeds. How can strength best be developed in Kids? Any athlete that wants to accelerate fast and have a higher maximum speed will need to be able to develop more power. What can be done to improve power? How can athletes develop endurance without decreasing speed. What is good long-term? What is bad practise? Important guidelines in the development of improved technique. Making sure there is technical improvement is the prime indicator of what is good coaching and what is not. Training Session Ideas - Over 10 A4 pages of ideas for training sessions. The section also contains guidelines for designing appropriate sessions to be more effective at improving technique and performance both long term and short term. There are many special sessions that should be done with young kids eg a 15s 100m runner could do a maximum speed session like 2 sets of 3 runs over standing start 30 or 40m resting between about 3-4minutes, and doing something different like Med Ball activities between sets. This section aims to explain how to design sessions that are appropriate - it is not just a collection of standardized sessions. Creativity is a big part of the fun of coaching and athletes love variety. The key to fun and effectiveness is a coach delivering a variety of effective training activities within certain guidelines. References & Recommended Resources - Includes about 30 links to special articles on the web and other resources. The information in the book has been gathered over many years. It is a combination of shared knowledge of a number of Australia's best Sprint Coaches and also information gathered directly and indirectly from some of the coaches of the Worlds Elite Sprinters. Order on CD the activities Video and the E-book of Training Kids for Speed for US$19.95. Adrian Faccioni (University of Canberra), Vern Gambetta (Gambetta Training Systems), Mike Hurst (Coach of Darren Clark, Maree Holland, Debbie Wells), Ron Wyld (Dalton Grant), Michael Khmel (Matt Shirvington, Patrick Dwyer), Cliff Mallett (Paul Di Bella, Damien Marsh, Sharon Cripps), Esa Peltola (Patrick Johnson), Peter Fortune (Cathy Freeman, Tamsyn Lewis, Lauren Hewitt),Tudor Bidder (Renee Poetschka, Declan Stack, Susan Andrews), Roy Boyd (Kyle Van der Kuyp), Jackie Byrnes (Melinda Gainsford, Jana Pittman), Phil Geddes (David Geddes), Lindsay Watson (Zid Abou Hamed, Todd MacDonald), Colin Wright (Tim Jackson, Jenny Laurendet), Paul Laurendet (Holt Hardy, Marty Byron, Amber Menzies, Clinton Hill), Matt Barber (Dean Capobianco), Andrew Jackson (Rachel Massey-Jackson), Loren Seagrave (Speed Dynamics, Evelyn Ashford, Donovan Bailey), and Dan Pfaff (Bruny Surin, Obadele Thompson, Donovan Bailey).